Victoria Falls, Zambia, Zimbabwe, Namibia, Botswana, South Africa, Swaziland, Lesotho, Namaqualand, the Battle Fields..
..we have the regions of Southern Africa outlined on planned tours. Tell us your touring needs, we take you there.. 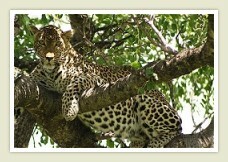 Your Travel into Africa for South African Safaris is an adventure with Touring South Africa. Experience the true Spirit of Africa and find yourself in a world of fun and exploration. 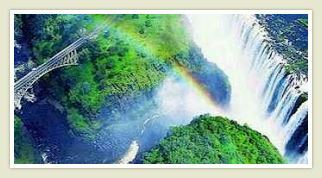 Victoria Falls tour : Stay at and Tour the famous Victoria Falls and see the 'Smoke that Thunders". Extend your stay at minimal cost. 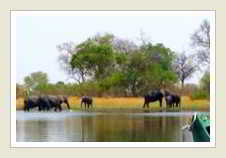 Visit Chobe National Park in Botswana from here. 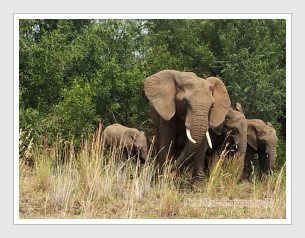 Kruger National Park tours: Spend a few days away in Mpumalanga Province and the Panorama route, and safari amongst the Big5 animals of Kruger Park, and/or a private game reserve. 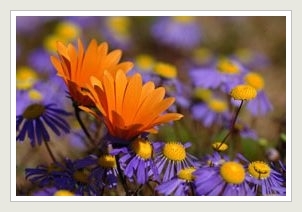 Namakwaland / Namaqualand tours: Join us on an unforgettable flower carpet journey through the splendour of South Africa's most spectacular wildflower region in Springtime in the Western Cape and Northern Cape Provinces. Book & finalise payment now!! Pilanesberg National Park tours: Full day: Spend a big part of your day in this world famous Big5 national park, and opt for a stop-over at Sun City, a mere 2 hours from Pretoria/Johannesburg. Namibia tours: See and experience the magnificense of the vast beautiful country of Namibia. 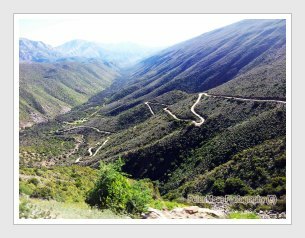 The South has the huge Fish River Canyon, second in size to the Grand Canyon, and the oldest desert in the world, with the highest sand dunes; the central area is home to the adventure capital of Namibia; the north abounds with wildlife and culture..
Around the Cape tour: Leave Cape Town behind and explore inland beyond the mountains and winelands... you will be surprised at the beauty that this region far out of the Cape Peninsula holds. Green productive lands, far and wide horisons, friendly people and open skies, deep valleys and beautiful folded mountains await you on a journey never to be forgotten. Botswana tours: The Okavango Delta is one of the big attractions in this strong democracy in Southern Africa. In this friendly country the wildlife abounds -- the wildlife migration is probably even bigger than that of the Serengeti! Drive there from Johannesburg, through the capital city Gaborone, or fly in, for an African safari in the huge conservancies of Xai Xai and the Okavango Delta. Touring South Africa is the tour operator of choice, based in Pretoria (Tshwane), in the Gauteng Province of the Republic of South Africa. The tours combine home comfort with combinations of exciting Big Five experiences, History, Culture and Nature. Apart from culture and history, the choices are great on your African safari, for seeing, photographing, touching and experiencing the wildlife in Southern Africa. Take a look at our regular tours on these pages, join us for the excursion or tour you need, and/or contact us for your tailor-made tour..
Our new series of tours throughout Southern Africa, are appropriately called "Discover Southern Africa". The tours in the series will be updated and added on to, (so watch this space)..
You can explore the BEST of South Africa and beyond, covering the sub-continent in different stages, by doing these different tours in the series. 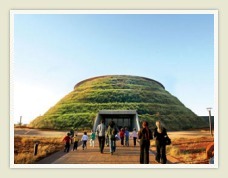 These tours are ideal for the visitor who has 'done it all' before, and want to do something different, or for those who want to discover the Southern African region in stages, covering the highlights, and including much more. By planning ahead, you can now budget for the most amazing tours to different parts here in our world on the southern tip of Africa. We are bringing you the best, on new routes explored, and compiled specially for the discerning traveller on a budget. Combine any of these tours to form a longer tour. Come join us, and experience Soweto, Pretoria, Johannesburg, Lesedi, Sun City, Kruger National Park, the Battle fields, Namaqualand, and everything in between and beyond..
..You must see Soweto with us..
...experience the detail and viewpoints of what happened on the Battle Fields ..
NAMAQUALAND Wild Flower region tours. The Namakwaland wildflower region tours take place during August and September each year, and must be booked WELL IN ADVANCE.